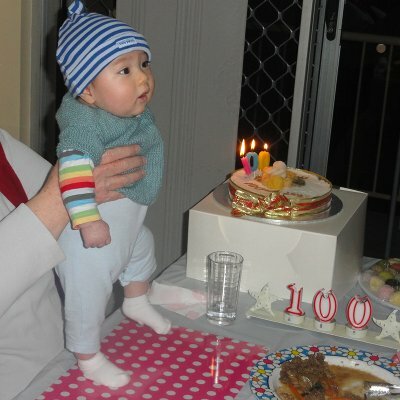 Many of you would remember I was hopeful that both my grandsons would wear cloth nappies/diapers. 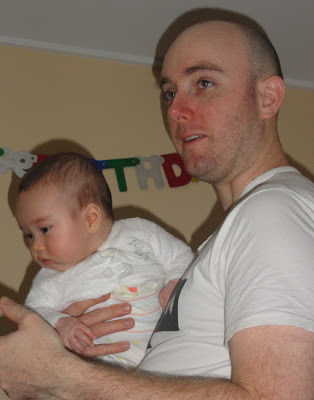 I was very happy when I set up a bartering deal with Rebecca at Bean Sprout Bubba and was able to help supply modern cloth nappies/diapers to both set of parents. Well, I have not been disappointed. The nappies/diapers have performed extremely well and have kept both babies dry and comfortable. Above and below we have our beautiful boy Jamie modelling (above) the Booroi nappy cover and below the cuddlefleece giraffe cover. I recommend Bean Sprouts Bubba to you - whether you're a parent or a grandparent. The catalogue of products is extensive, I even bought a little hose attachment for the toilet, for both parents, that's been a great help with "full" nappies/diapers. But what I love about it most is the service and helpful advice Rebecca is happy to give. If you're a new parent, or a new grandparent like me, the world of modern cloth nappies is probably alien to you. Please don't hesitate to contact Rebecca who will guide you through the ins and outs of nappies and baby needs. Booroi have recently revamped their prefold products. Bigger Booroi nappy covers are also available in sizes small, medium and large to cover over these prefolds. To take part, all you have to do is post a photo on your own blog, write a short caption explaining it, and link it back to here. Please write a new post, don't link to an older one. When your photo is published, come back and add a comment below, with a link to your blog photo so we can all find you. Please visit all the blogs that appeal to you and leave a comment. Slow down, take the time to cruise around and enjoy your cyber visits. I'm still thinking about yesterday. We travelled down to the Gold Coast to visit the family and naturally saw Jamie and Alexander again. Everyone is fine and it was good to catch up with them again. The main reason for our visit was that my boys, Shane and Kerry, just celebrated their birthdays. Shane turned 31 just after Alexander was born and Kerry turned 30 this week. I made an apple cake for Shane and a coffee cake for Kerry. It is really wonderful to see them both as proud and very involved fathers of their own sons. 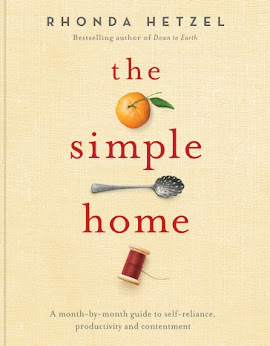 Congratulations to Karen and Joyfulhomemaker, you have each won a copy of the book How Does My Garden Grow. Their comments are below. Ladies, would you please email your postal address to me at rhondahetzel@gmail.com Thank you, and thanks to all who entered. I have been very busy lately making soap, while Hanno has been wrapping it and packaging it up to post all over Australia, the US and UK. Thanks to everyone who placed an order for soap or something I made. 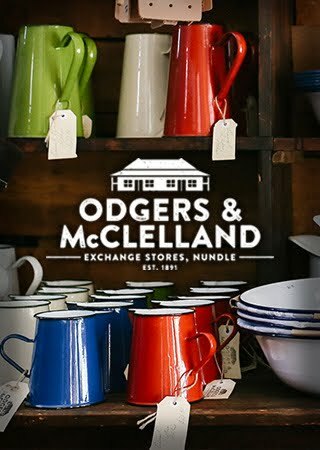 It is helping us with our finances and makes us feel good to be earning money selling what we've made with our own hands. I was very pleased to receive the first re-order from someone who bought the soap and wanted more. It makes me feel good knowing that something that helps us live well here can help others too. One of the things I needed to do when I started selling the soap was to simplify the process. I needed it to be simpler and quicker without losing the quality I expect and want to pass on to you. I also wanted a recipe that would use a full packet of *copha. I didn't want little pieces of copha floating around in our fridge. So I came up with a new recipe. 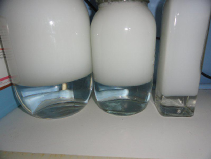 It has only four ingredients - olive oil, coconut oil, rain water and caustic soda/lye. It took a while to get the mix right because I had to test all of them on myself, so although the simplifying process took a long time, it's easier now to make the soap. I'm trying to make a batch every couple of days. 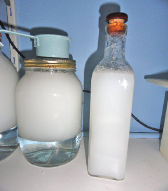 *copha is solidified coconut oil which works well if you can't find liquid coconut oil, or if it's too expensive. You can buy copha in most Australian supermarkets in the butter section. It's currently $2.66 for the amount you'll need for this recipe. I am happy to share the new recipe with you. Please be guided by all the warnings I've written about here and the use the same method for making the soap. Click on the link to go to the warnings and the post on how to make soap. * If you don't have rain water, collect enough tap water the day before you make the soap and leave it on the bench to sit. That will allow the chlorine in the water to evaporate off. If you don't operate in mls and grams, there is an online conversion calculator here. If you've never made soap before, it's a great skill to have and it will give you and your family excellent soap that you can use on everyone from baby to grandpa, including everyone with sensitive skin. I use it to wash my hair too. I've used it for a few years now and my hair is healthy and shiny. No more expensive plastic shampoos for me. It's either my hand made soap or bicarb from now on. Put simply, to make soap, you mix ingredients 1 and 2 together, give it a good mix and it will heat up without you putting it on the stove. You have to wait for it to cool down. While it is doing that, you add ingredients 3 and 4 to a saucepan and heat it up. You wait for 1 and 2 to cool to 50C/112F and you wait for 3 and 4 to heat up to 50c/112F. When both mixtures are at the same temperature, you combine them and mix. I use a stab blender and it comes together nicely. You can also use a mixer or hand stir it. What ever you use has to be able to mix without it splashing everywhere. When you reach "trace", and that is explained in the above link, with a photo, it's done. You pour it into your shapes, cover it so it cools slowly, and leave it. The next day you can take the soap out of the moulds and let them sit to cure and harden. But please, if you intend to make soap, do it when the children are in bed and there are no dogs and cats under foot, and make sure you read the guidelines in the link. If you've been meaning to give soapmaking a go, if you've been wanting to add another simple string to your bow, this might interest you. If you want feedback on how you're going or if you just want someone to see your soap, take photos and start a thread about it at the forum. I'll make sure I look out for any of those threads and help as much as I can. I'm sure the other soap makers there will as well. PS: I spent yesterday at the neighbourhood centre doing a fermentation workshop. We made up sourdough starter, vinegar and ginger beer and everyone went home fired up and enthusiastic about future fermenting. It was great to see. Oh, and one of the ladies from the last workshop arrived with a huge bag of Seville oranges for me! Sevilles are the traditional orange for marmalade but you can't buy them in the shops here now because people aren't making enough marmalade. That's on my list now. As usual, I'm running behind a bit so if you're expecting an email from me, or some soap, I'll be back on them again today. Please be patient with me. I am really sad to relay this news - our beloved artist Margaret Olley died today. She was 88 years old. Margaret was my favourite artist and one of my favourite people, even though I had never met her. We have a large print of her Cornflowers hanging in our kitchen. I named a couple of my chooks after her, and I think she would have loved that. I wrote about Margaret here. Here is some of her work. Today is a sad day for me. I'm really pleased that vegetable gardening has become popular again because my optimism for the future grows when I think of it. I often receive emails from readers who ask me to recommend a good all-round gardening book. That's difficult to do because we all come from different climates and there are a variety of ways to garden and levels of experience. I am an organic gardener and have been for about 30 years. 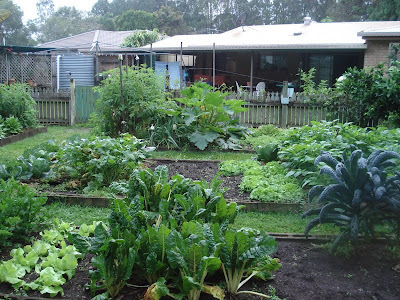 We had a vegetable patch and chooks in our last home, and when we moved here in 1997, I wanted to keep the vegetables growing and maybe expand a little. I was lucky, just before we moved, in 1996, Linda Woodrow produced her very influential book, The Permaculture Home Garden. I had already toyed with the idea of permaculture, bought Introduction to Permaculture and later The Permaculture Designer's Manual by Bill Molleson but they didn't grab me. Interesting yes, but not enough to get me to think more about a Permaculture garden. Then I picked up Linda's book. 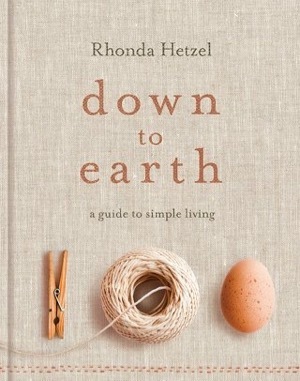 I was hooked ... from the first sentence of her perfect introduction: This is a book about saving the planet and living to be one hundred, while throwing very impressive dinner parties and organising other creatures to do most of the work. How could anyone resist that! The cover has changed but it's still a great book. I looked, and Linda's book is available on Amazon and at Fishpond. Linda reads here now and she doesn't know how highly I regard her book, or her, so I hope it's a pleasant surprise. Congratulations on being in print for 15 years, Linda. That is a rare achievement. The other book I would recommend, should you ask, is Lyn Bagnall's Easy Organic Gardening and Moon Planting. This book taught me things I didn't know about plants and is full of the knowledge of a very experienced organic vegetable farmer. 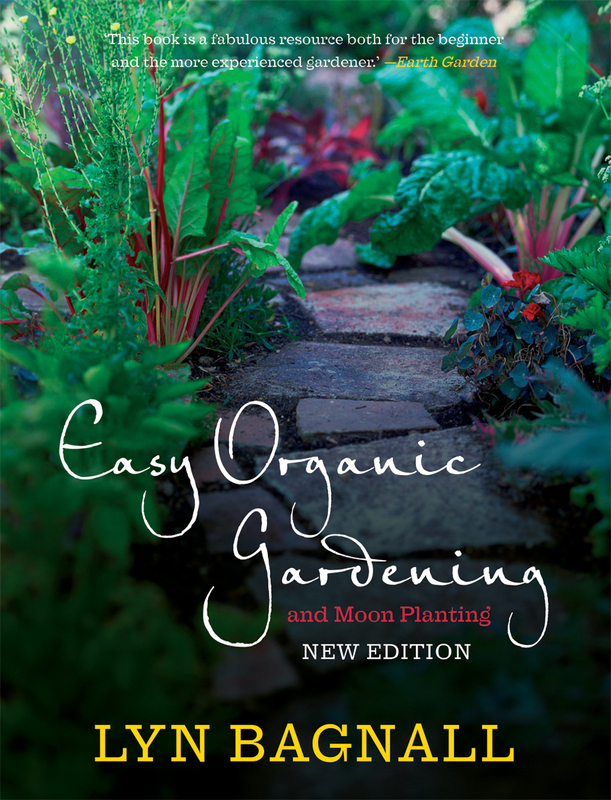 This book is about the organic production of vegetables, fruit and herbs, and if you plant by the moon, there is a planting guide up till 2013. There is no better book for the whys and wherefores of organic gardening. Lyn sent me a signed copy of her book when it was published and I treasure it. 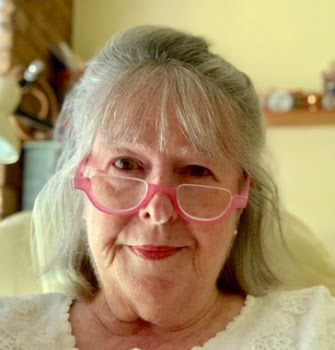 She has the most helpful blog: http://aussieorganicgardening.com/ where she shares her vast knowledge with all who go there. If you want to buy Lyn's book, you can do that from her blog. 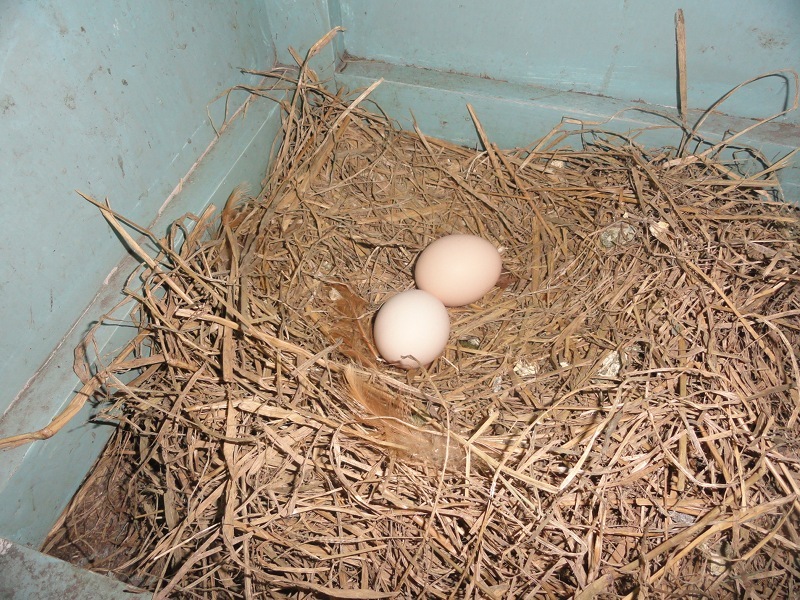 BTW, neither Linda nor Lyn know I'm blogging about this today. Neither of them asked me to promote their book, nor did their publishers. So that's it, short and sweet. I have a lot of cook books but I only have two gardening books. I guess that says it all. We had quite a few things to do on the weekend, but our work was balanced with relaxation and slow times. We got things done, we worked steadily, yet that balance gave us enough down time so that we worked through the weekend without feeling worn out or stressed. I had to organise my soap purchases and work out how much more soap I need to make. I planned to do that on Saturday morning but it was Sunday morning before I got around to it. I had knitting in mind, I wanted to finish a little red woollen hat, so that called me to my chair a few times and I just left everything else undone. It didn't worry me, I knew I'd get through everything on my list; it was just rearranged a few times when my priorities changed. I changed the bed linen and did a couple of loads of washing, sorted through some clothes, started writing my notes for Tuesday's fermenting workshop and did a bit of reading. Sunday afternoon came around with the winter shadows long in the yard, and instead of cooking up a stew or roast, I made a chicken salad. I was tempted by the mass of iceberg lettuce seedings I've grown for the garden. Hanno's planted a few but there are so many, I grabbed a handful, cut off the roots and after a good wash, and with radishes and tomatoes from the garden, it made our Sunday tea quite special. I still had a small amount of pikelet batter left over from morning tea, so I made some tiny pikelets for dessert and topped them with the strawberry jam I made last week and local cream. It's amazing how delicious a simple meal can be when freshness and seasonal food play a major role. Another thing I needed to do was to re-pot and prune a large topiary fig. It's usually green and lush but I moved it a few months ago and it didn't like the place it was taken to, and dropped all its leaves. My job was to get Hanno to take it back to its old spot, to prune the top and the roots and to settle it back in its favourite location. As soon as it was moved, I did the necessary pruning, added new soil to the pot and watered it in with seaweed tea. If you've never used it before, seaweed concentrate is excellent for transplantation shock and is a must-have in the organic garden. 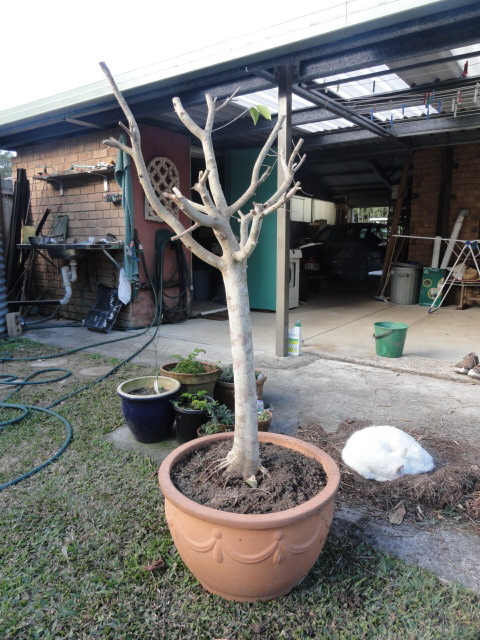 Our cat decided she needed to sleep in the pruned roots, you can see her in the photo. The fig looks very sick and feeble now but by Christmas it will be back to being an attractive part of my potted garden. Hanno was in the garden most of the weekend. He's continuing to cut down the camphor laurel tree and has friends coming in to take the wood for their fires. Sunday morning he went to a market in Caboolture to get some seedlings and planted them later in the afternoon. While we were standing there talking, three young peacocks - frequent wanderers in our neigbourhood from the local caravan park, landed in the chook yard and prepared to feast on the chook food. Those birds look so beautiful but they're a pest to have around because, left to their own devices, they'd easily clean out the chook rations in an afternoon. Also over the weekend I spoke with family - Shane, Kerry and Tricia on the phone, and Jens and Cathy when they came for morning tea; as well as a couple of friends. Hanno and I have made arrangements to go to the Gold Coast again during the week to see everyone and the babies. It is so important to make time to see the people we love. It's not good enough to make excuses and put it off. These visits and phone calls help make us the family we are so they take priority over anything else we may do. And now another week is starting for all of us and I'm beginning to think about Christmas - both gifts and food. I'll soon start thinking about making my Christmas cake so it has time to mature. If you're interested in doing something similar, Rose has started a Christmas cake thread at the forum and I think they're currently at the soaking fruit stage, so it's not too late to join in. I should write a list of the Christmas gifts I'd like to make this year. I prefer to do that early because now that money is a bit tight, I'll have the time to look around for the best price before buying - either for the gift itself or the materials to make it. The draw for the giveaway books will be on Wednesday so if you haven't entered your comment yet, now is the time. I hope you have a productive and enjoyable week. Don't forget to take time out to look after yourself; it's important. I have been using Vivian's Eco Yarns for a few months now and I'm never going back to the yarns I was using before. I love the feel of these often organic and gently produced cottons and wools and I feel confident giving what I make to my grandchildren. I want them to have the best - this is it. Here is Jamie wearing the little kimono top I made below. Cotton Flamme yarn, in 4 natural colours. Super soft and Naturally coloured. No nasty chemical anything, and safe for babies to chew. Brand New Bamboo yarn in 4 ply. Try it, its beautiful. Llama Yarns and Fibres. Perfect for Knitting and spinning. 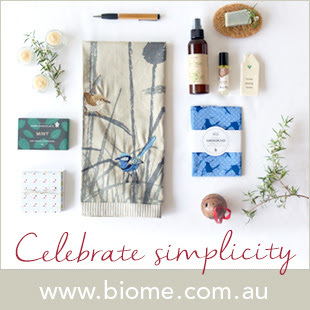 These are sourced from a LOCAL Australian farm and are produced here in Australia. Please support our local farmers. Handspun camel yarns available. These hand spun yarns are made on a drop spindle by the mongolian nomads and supplement their income as they spin. 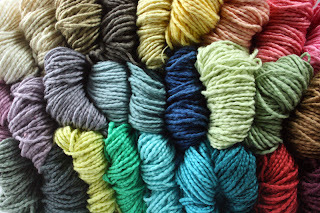 Merlin Yarn: The wonderful combination of the soft Merino and hard wearing Linen makes this a very special yarn. SOAK out of stock flavours(scents) have arrived. The Full sized versions are back in stock and the special Ravelry scent is also available. Check out the Mooi yarns, the Woolganic yarns, the Book and Magazine section and Ashford Knitters' Loom page for the revamped areas. 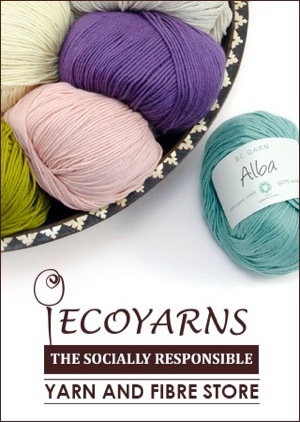 The Eco Yarns site shows their fine products, with prices, so you can spend quite some time there checking various yarns, thinking about how the beautiful colours will fit into your projects. Just click on the link to go there. I know it is sometimes a bit frightening ordering from the internet, but I can recommend Eco Yarns to you for the excellent quality of their yarns, their friendly service and their reliability. Please support my sponsors. The red banana flower opening with the tiny green bananas forming at its base. We have about five more weeks of winter to go so I was surprised to see our bananas already forming new fruit. I've been thinking about planting more fruit, maybe berries and finger limes, as well as herbs. That period between late August and mid-November is prime growing time here. We have to make the most of it. Thanks for your interesting and thoughtful comments during the week. There were many new names I haven't seen before. Welcome. I hope you find information and inspiration here to help with any life changes you're considering. And to all the regular readers, all those who read here while feeding the baby, or having the day's first cup of tea, or who pop in during a quiet time at work, or just before they go to bed, or just whenever they can, thanks for your continuing visits. I'll see you again next week. The winner of the Fiskars axe is Linda. Thanks to everyone who entered, thanks to Fiskars for the prize. Hi Rhonda, We would use an axe like this because my husband keeps discussing how he would like to chop wood by hand. He has decided using the chainsaw (and fossil fuels) is unnecessary. He says he could do it by hand with a good saw and good axe. Sorry I'm writing a novel length comment but I have been wanting to tell you how inspirational I find your blog. Although I have been living many elements of the simple life for years, your blog has reminded me to enjoy the process and to smell the roses on our busy way! Thank you! I really enjoy living where we live. The climate is wonderful, we can grow food all year and unless we have a bad year, it's neither too hot in the summer nor too cold in the winter. We live on a small piece of land at the edge of a pine forest that is bordered by a permanent creek, lined with rain forest. In the old days, trees were cut in the mountains behind us and brought to a timber mill on the other side of our one lane street. Logs were launched from our backyard into the creek and floated downstream to the Pacific Ocean. There, sailing ships waited for the logs which were loaded and shipped to places far, far away. Stripping tall timbers from our forests no longer happens here but not much else has changed at this end of the lane since those days. 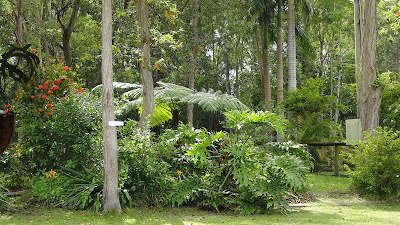 There are ten houses here now, but the mango and nut trees they planted back then are still here, and when you're quietly working in the garden you can imagine those days when logs would have rumbled by, probably right through where our house now stands. Our front garden (above) and our vegetable garden (below). The house from the back. You can see the solar panels, the solar water heater (right) a couple of skylights and the whirly birds. Of course, Hanno's ladder is there; he's often on the roof pottering around, checking or fixing things. Life is good here and we hope that even after we've gone, this land will look the same as it does now and support the efforts of a hard working family - hopefully our descendants. The key to this is to protect the land, to keep it vegetated, to remain organic gardeners, to use as few chemicals as possible, to continue to encourage birds and wildlife and to remain radical conservers of the land we live on. We will continue to harvest water from the roof, generate electricity with our solar panels and as much as we can, live a low tech life. 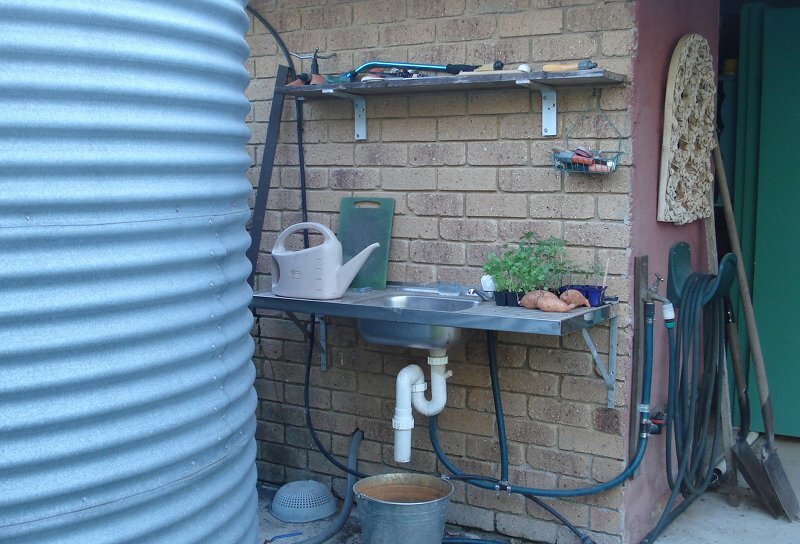 Our outdoor sink and one of the water tanks. We wash vegetables and fruit here, and our hands, so we don't bring too much dirt into the house. 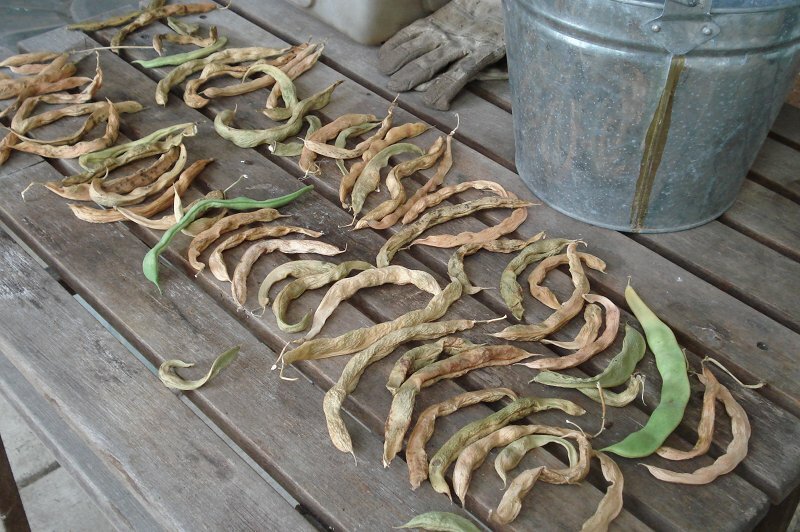 Part of our low tech approach is to gently manage our climate for our own benefit. We use what our natural environment gives us. 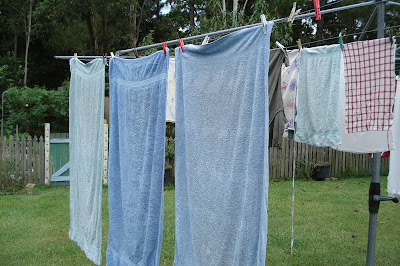 We dry our clothes in the sun instead of using a dryer; we use the soil to produce food; we use harvested water on our crops, instead of using town water; we use cross ventilation as much as we can to cool our home. When we first came here to live we installed whirly birds to extract hot air from the roof space; they're powered by even the slightest breeze. 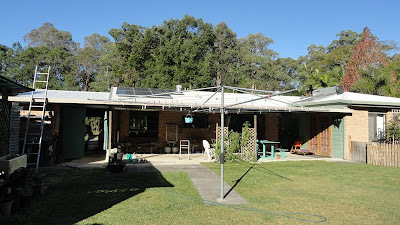 Hanno has just finished painting the entire roof with solar-reflective paint which makes a big difference to the temperature of the metal roof and therefore, the temperature inside in the hot months. We also have three skylights on the roof that bring more light to the kitchen, bathroom and laundry without needing to flick a switch. 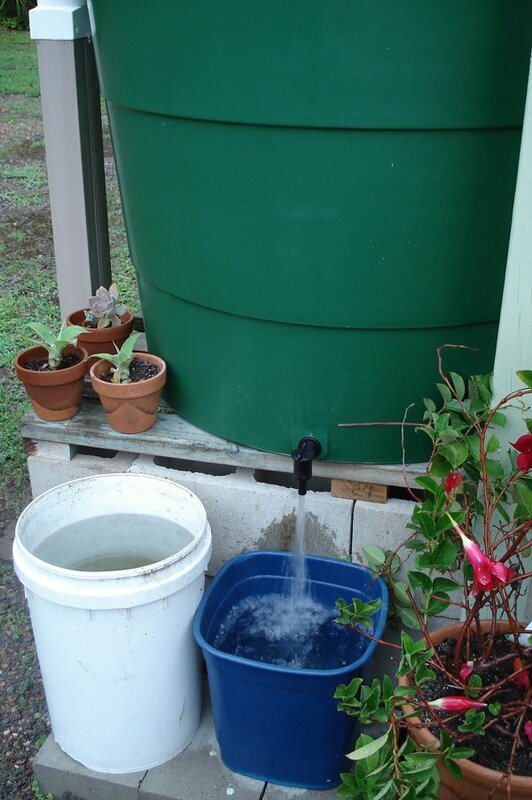 Water is harvested from the roof and stored in three water tanks. 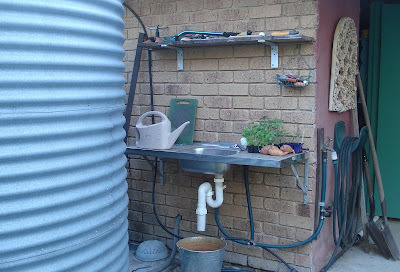 This small one (above) is used to water pot plants on our front verandah. This tank is also used as a platform for food that defrosts in the sun. Even now in mid-winter, a shoulder of pork takes about three hours to completely defrost (below). I sweep instead of vacuum, we removed our dishwasher a couple of years ago and wash up by hand. I would love to say that we harvest wood from our old trees and use it for heating but Hanno has an aversion to wood fires so we go without heating except on very cold mornings when we heat the kitchen for a couple of hours with a reverse cycle air-conditioner. I would also love to say we had an outdoor wood-fired bread oven that we use to bake bread, cakes and biscuits, but I can't. Maybe that is something I can look forward to in the future. 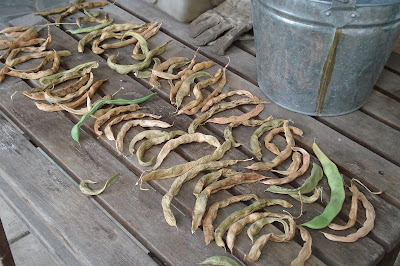 Beans drying in the warm air. I wish we could use more low tech ways of doing house and yard work, or heating/cooling our home. I wonder what you're doing. I wonder if there are some things we've just not thought of but could easily do if we had a clue. So please, tell me how you manage heating and cooling, water, electricity, defrosting, cooking, drying and washing in a modern home environment. This blog has become a place for sharing ideas, often radical or forgotten ones, so I'd love to hear what you're doing in your home. About a year ago I was contacted by the British publisher Dorling Kindersley asking if they could use some of my blog's loofa photos in a book they were producing. I said yes and asked them to send me some copies. That book has now been published and I have those copies. The book is produced in association with the Royal Horticultural Society and is called How Does My Garden Grow. It is suitable for girls and boys aged 7 - 12 year old but would be a useful picture guide for a younger child with someone reading the text and explaining as they go. I've read through the book and it's a very interesting and accurate guide to the garden and projects coming from it. The book features subjects such as growing seeds, the basic requirements of water, sun and soil, how to grow corn and make corn paper, herbs, water gardens, loofas and a variety of recipes using the food grown. I have two books to give away and will send them locally or internationally. To enter the giveaway, all you have to do is make a comment about who you would give this book to, and why. I'll do the draw next Wednesday. Good luck! 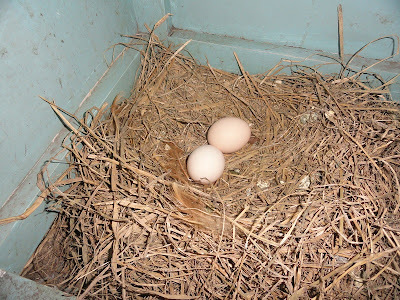 Sarndra's blog is back. I'm looking forward to seeing some lovely photos there. I watched Masterchef yesterday because I wanted to see what they did with their guest, the Dalai Lama. I thought it was a strange mix to have the Dalai Lama on a cooking show but he has made me think about many things in a different light so I was keen to see what happened. One of the judges remarked on his saying: "I sometimes think that the act of bringing food is one of the basic roots of all relationships." It's a quote I had not heard before but how could you not agree with it wholeheartedly. Many people think of cooking and the serving of food at regular times every day as a chore that is endured rather than enjoyed. I choose to think that the person who decides on what food will be eaten, the person who chooses the food, either at the shop or in the garden, and the person who serves what has been gathered and cooked, is the person who brings the family together every day. That is an significant role to play in any family or group. A shared meal should be a part of everyone's day. Unfortunately many people eat alone. When everyday activities, especially in a young family, see children at school and parents at work, a meal that is shared in the evening is not only a symbolic act of drawing the family back into the home again, but is also a valuable way of reconnecting and learning what each person did during the day. This is a time for sharing not only the food but thoughts, plans, worries and solutions. If you have children in the family, this time spent together may give you the feeling that everything is fine, or it may alert you to something you should be concerned about. A couple living together but separated when they're at work, need to know they will sit, relax and share a meal and the day's news later in the day. Still now, Hanno and I sit down at a set table every evening for our meal. When we have people visiting, it generally involves sharing a meal. There is something about sitting at a table that has been prepared with cutlery, glasses, a water jug, and maybe flowers and candles, that tells all who sit there, they're welcomed into this home. I know it's sometimes tough, especially with a young family, to provide that shared meal day after day. When I was younger and experiencing those busy days, when fatigue took over and all I wanted was to sit down with my feet up, or, better still, sleep in a cosy bed, I thought about the possibility of not having a family to share anything with. Imagine that. That every day you had no one to eat with and share experiences with. That usually brought me back to reality and I felt privileged to cook meals and serve them to my family. It doesn't matter what is served - it can be simple, or full flavoured and hearty, it's the sitting down and sharing that counts. Last night Hanno and I had fruit for dinner, tonight it will be soup. It's not just the food, it's the connection as well; the combination of the two nourish us and let us know we part of something bigger than ourselves. It was raining and cold here on the weekend, I had a few things to catch up on, and one of them was a batch of laundry liquid. 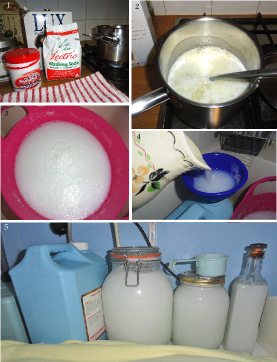 I know many of you already use this but there are many who haven't made the leap yet, so I'm hoping that another post about how easy it is to make and how much it will save you, will be the push you need towards making a batch yourself. All you need is water, soap, borax and washing soda, all the products are usually available at the supermarket. The soap can be either soap flakes or soap that you've grated yourself and it can be any kind of soap - laundry soap, homemade soap or Sard soap, if you want an extra cleaning boost in your washing machine. Sard soap contains an oxy-bleach and would be excellent if you're washing a lot of white clothes or you have children or a tradesman in the family. In addition to your ingredients, you'll need a medium sized saucepan, a slotted spoon to stir with, 10 litre bucket, funnel, jug and containers to hold 10 litres of laundry liquid. So, you've nearly finished and it's only taken less than ten minutes so far. When you're sure it's completely dissolved, pour the mixture into your 10 litre bucket and fill the bucket to the top with water from the tap. You've made laundry liquid! And it's cost you about $2 Australian. If you bought the equivalent about of laundry liquid here it would cost you between $80 and $90 (see below for cost comparisons in USA and UK). So when you take into account the making, pouring and storing, it's taken you about 30 minutes. I make this about once every four months. If you have a large family, you might make it every two months. And it will save you about $80 every time you make it. How long would you have to work to make $80? Saving it is much easier. 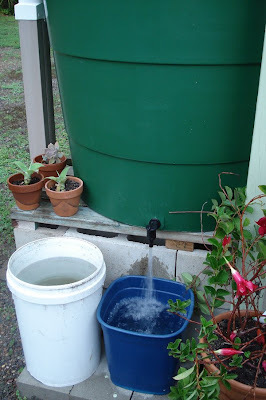 Once you have the laundry liquid in your bucket, stir it around again, then start filling your containers. It's important to leave enough room in your containers to shake the liquid before you use it because it will separate. See below for more information about this. As you can see, I store my laundry liquid in a five litre blue container, a three litre glass jar, a one litre glass jar and a 750 ml bottle. I use the bottled laundry liquid for cleaning. It's great for cleaning up spills, for cleaning around light switches, door handles, walls and floors. I use that little blue scoop to put the liquid into my front loader washing machine and I always use the one litre jar as my working jar. When it's empty, I refill it from the larger containers. Above is the laundry liquid after it's been sitting for 24 hours. It's clearly separated into to layers - the top layer is gel-like, the bottom layer is watery. You need that space in your container to shake and mix before you use it. And here is my cleaning liquid that I shook just to show you what it looks like. So don't think you've done anything wrong if your mixture separates, it's fine, it just needs a good shake. And to answer Shelly's question yesterday, this is safe in septic tanks but not for grey water. The borax in the mix builds up as boron in the garden and that is harmful to plants. If you want to use your grey water, leave out the borax. ADDED LATER: This is also an excellent stain remover. I rub it thoroughly onto a stain with my fingers, let it sit for an hour, then put it in with the normal wash. It works. Don't expect homemade laundry liquid, or the powder, to make suds. Clean washing doesn't need suds to make it clean. The froth and bubbles you get with commercial cleaners is made with chemicals not needed for cleaning but are included because they think we want bubbles. I've written before about the small steps we all take. This is one of them. This small step doesn't cost a lot, it is easy to make and it lasts a long time. But if you do it, it will save your hard earned money, it will mean you'll have fewer chemicals in your home, you'll buy less packaging and the water you eventually send into the system will not be laden with salt, phosphorus and fillers. Maybe this small step is not so small after all. A little while ago, Fiskars sent us one of their new axes. It was right before Hanno started cutting down that camphor laurel tree so it came in handy, right when we needed it. 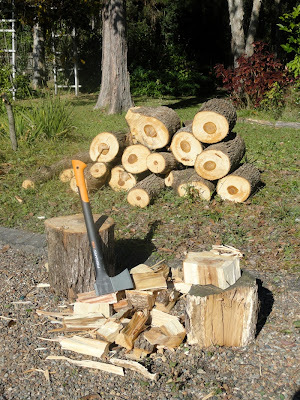 He used the chain saw for the heavy work and used the Fiskars axe to chop the smaller branches from the main trunk, then to split some of the wood. Hanno said it is an excellent tool, it's easy to use and feels good in the hand. Even the very hard wood of the camphor laurel was easy to split with the Fiskars axe. Fiskars have given me another axe to give away to one of my Australian readers. It's the same as the one we're using here so I know it is a good reliable product that Hanno and I are happy to recommend to you. If you'd like to be in the draw to win this axe, remember, Australian readers only, add a comment about what you need the axe for. The draw will take place next Thursday. I have another giveaway coming up next week, and it's one that everyone can enter, no matter where you live. More details later in the week. The Butterfly Loom has been a welcomed addition to my pages for a few years now. Carolyn took a break and is now back to show you how to make rugs and many other things, even if you can't knit or crochet. 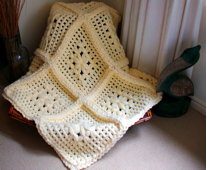 Just Wrap and Knot – no knitting or crochet to create this beautiful Throw. It's a great way to use up bits and pieces of yarn, just wrap on the Board and keep adding different textures as you go. Absolutely everyone – any age, any skill level – can use the Butterfly Loom with great success. The Butterfly Loom is truly addictive and great fun. This rug is so easy to make, it could be created by a 10 year old child or a Grandma. 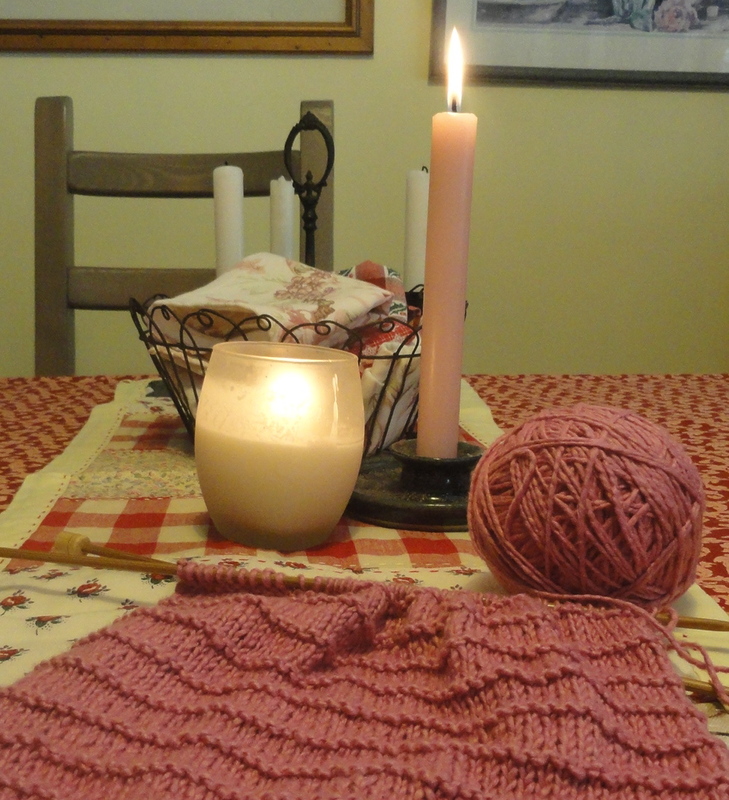 Carolyn's website is here and her blog, with lots of projects and inspiration, is here. Just click on the links to go there. I'm thinking I might juice these lemons on the weekend. It's part of our yearly juice harvest; the juice from these lemons will go into plastic bottles and will be frozen for later in the year. Then it will be made into summer cordials and used in cooking. We generally leave the lemons to sit on the back table for a week or so which results in a lot more juice. I had an email from a reader the other day asking about non-chemical cleaning. She has severe allergies and breaks out in a rash and gets itchy skin when she touches any commercial cleaning product. She's at her wit's end trying to find something she can use to clean her kitchen. Luckily, she recently made some of my olive oil and coconut oil soap and she seems fine with that so she wrote asking if I had hints for cleaning with only this homemade soap. I use my homemade soap, brushes and cotton dishcloths to clean my kitchen. I do use a small amount of bleach (50 mls/2 ozs) occasionally to clean my brushes, tea balls and sink and I use bicarb or salt to clean stained coffee and tea cups. Bicarb, wet on a dishcloth, will remove tea and coffee stains without using any harmful chemicals. Salt will also work for this - wet, on a cloth. To clean the tea balls, I pour 50 mls/2ozs liquid bleach into a small container and fill with water. I soak the tea balls in this for about an hour, then scrub them with a brush. Just before I tip out the bleach solution into the sink, I scrub the sink and around the taps with a soapy brush, or wet bicarb on a brush, then I rinse it off. When everything is clean and shiny, I put the plug in, cover the bottom of the sink with water, then pour in the bleach solution. It sits there for about 30 minutes, then I take the plug out and let the water run out. This cleans and disinfects the sink and pipes. I am very mindful of the amount of bleach I use and always keep it to a minimum. The best tools I have for cleaning are my brushes. I have several. The one I love the most is a camel hair round brush which is pictured below on the right. It fits my hand perfectly and it cleans really well. The bristles a softish so it gets into all the nooks and crannies, but firm enough to be efficient. It's an Crabtree and Evelyn body brush that I bought for $16.95 about a year ago. The brush above in the centre is a German stiff bristle brush. It's invaluable for doing those scrubbing jobs like the kitchen sink and around the sink hole. The camel brush is better around the taps. I bought that German brush in the Blue Mountains when I was staying with Tricia. The great thing about cleaning brushes is that they will remove most stains and clean effectively without using too much besides water and sometimes homemade soap or bicarb. They will get into areas around taps and plug holes much better than a cloth will. You have to remember to clean your brushes properly when you've finished using them by cleaning with soap and water, or just rising off with water. Make sure they don't sit in water too long or the wood will split. To disinfect your brushes, just sit them in a weak bleach solution similar to the one above, for 15 minutes, then rinse and let dry. Don't waste this bleach solution. Even when you've used it to soak something in, it's still an effective cleaner. Pour it down a sink to keep the pipes clean or pour it into a half bucket of water and soak your mop in it. So for my reader who can't use anything too harsh, and for all of you who are trying to cut down on the chemicals in your home, look out for good brushes, use a bit of elbow grease, pure soap or bicarb, and you and your brush will really clean up. A couple of people commented and a few more emailed asking for Sunny's recipe for Korean BBQ beef, which is called Bul Go Gi. Not only has she given me the recipe, she's remade the food and taken photos so it's easier for you to make it. Thanks for your help with this, Sunny. I send my love. As with all Asian cooking, you do all your preparation and cutting first. 1. Soak shitake mushrooms in warm water until soft. 2. Prepare and slice vegetables: slice onion and mushrooms, cut carrot julienne, cut shallot finger size. 3. Blend marinade sauce ingredients using blender. 4. Marinate beef in the sauce with sliced vegetables. 6. Heat the pan and add 2 table spoons oil. 7. Cook until beef has changed colour. 8. Serve in the plate on the table for everyone to help themselves. * It is usually served with rice in Korea. * You can put more or less sauce as you like. * You can buy sliced Bul Go Gi beef and shitake mushroom at Korean supermarket. * You can use any kind of mushrooms (like button mushrooms). Ingredients below are for one person - multiply by the number of people you're serving. 1. Soak dried champignon mushroom and glass noodle in warm water until they are soft. 2. Slice onion, julienne carrot and cut beef into strips. 3. Marinate beef strips in the sauce 2 for 20mins. 4. Boil sauce 1 for 1minute and put aside. 5. Blanch spinach for 30 sec and drain water. 6. Heat the pan and add 1 tablespoon oil. 7. Saute vegetables, mushroom and beef separately and then put aside. 8. Saute drained noodle in the heated pan with 2 table spoon oil and boiled sauce 1 until noodle is soft. 10. Put on the serving plate. Sunny cooked both these meals for Jamie's 100th day celebration so I can tell you they are delicious. If you've never tried to cook Korean food before, these would be good to start with. They're both fairly simple, and they're healthy and delicious. Just a note to those who've ordered goods from my shop: I'll be in touch with you tomorrow with details of postage and payments. I'm at the Neighbourhood Centre today. The baby's arrival has put me back a day. I hope you enjoy what you're doing today. No matter what it is, take 10 minutes for yourself to sit and relax.